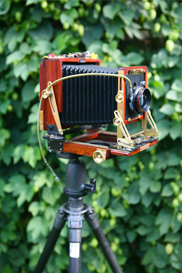 Because I have fielded lots of questions regarding the framing That I select for my Fine Art Landscape Photographs, I’ve finally decided to write an informative piece about this very subject, and here it is! Many people have noticed that when my fine art prints are seen in shows or exhibits, they are all framed very similarly and most people tend to find the framing very attractive(at least the ones who hate my framing don’t tell me about it!) 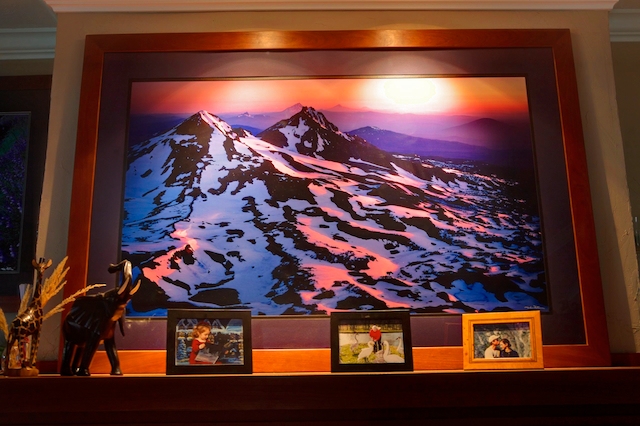 Below is one of my large format landscape photographs framed and hanging over the mantle in my house. A little bit of history will reveal why I frame my prints the way I do and then I’ll go into how I actually make the frames. One of My Large Format Landscape photographs framed with the Cherry wood frames that I make by hand in my basement workshop. Long ago, after I had printed my very first large scale fine art print, I took my print into a frame shop. Lets just say that it is a very large chain type of frame shop. This particular store frequently has 50% off sales, so I took a coupon in and selected some matting,mounting,glass, and moulding(the pre-made framing material). When the charges were totaled, the price was mind bogglingly high! Even at 50% off! I quickly realized that I would not be able to afford to frame many large scale fine art prints with this ridiculous pricing structure. A Do-It-Yourself mentality took over and I decided to try to make my own frame. Because I am fairly handy and I have done a little furniture making in the past, I extrapolated from what I already knew. 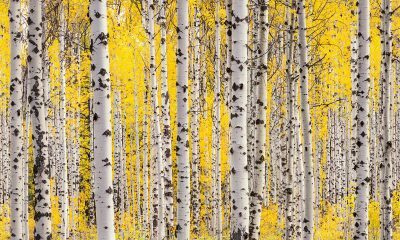 An underlying insecurity drove me to select cherry as my wood of choice because I knew that if no one ever bought one of my framed prints, the prints would still match the mantle in our living room, which is also made of cherry wood! I have to admit that I have also had a preference for cherry wood in that It is hard, works well, it often has wonderful grain patterns and I think it looks beautiful with a natural Oil finish which I prefer. I’ll spare you the intricacies of the evolution of my framing techniques and I’ll jump straight to how I make my frames. Before I delve into the intricacies of frame making, let me preface everything by saying that the following pictures are in no means fine art. They are snap shots. I’ll also add that my process of frame making is not fine art. It is hard blue collar work, that makes me feel tough. It is dirty, sometimes physically tiring, and after a long day of frame making, I’m exhausted. That being said, I love the results. I describe my frames as being simple, elegant, natural, and unique. They are a perfect compliment to my fine art photography. They are not perfect, because the real cherry wood that I make them from is not perfect, but it does have wonderful character that makes it much more interesting that processed, fake frames. 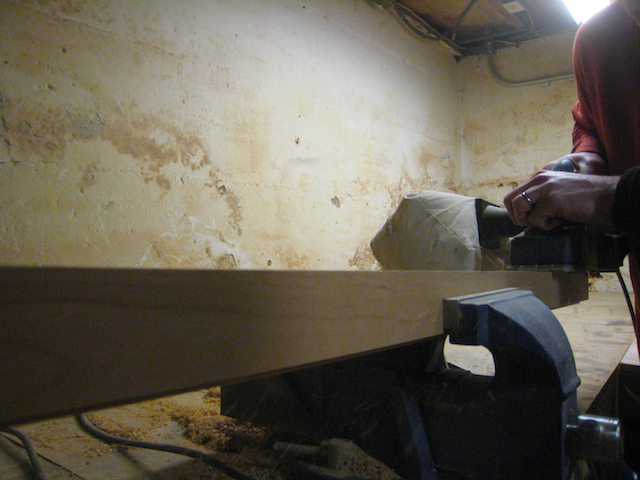 I start my process with real, cherry wood that I buy at Hardwood Industries here in Bend Oregon. The guys there, Tom, Hunter, and Mike are very helpful moving pallets of wood around with their forklift so that I can get to the high quality cherry wood that I need. I go through big piles of rough sawn wood an select boards that have mostly heart wood and interesting grain that I think I can make into a beautiful frame. Below is a pile of hardwood in the raw at the Hardwood Industries. 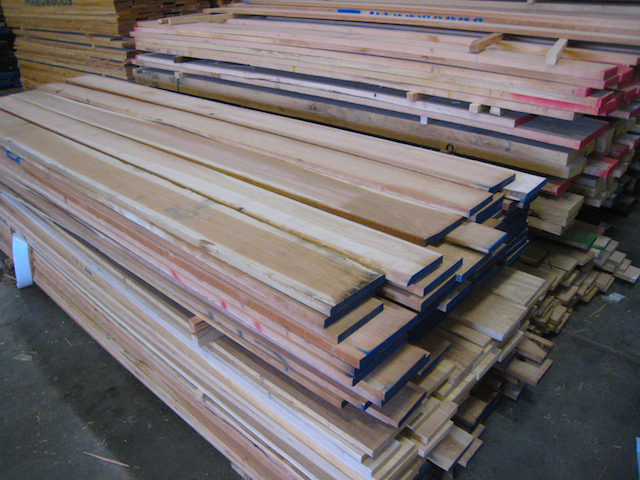 Piles of rough sawn Cherry at Hardwood Industries, in Bend, Oregon. After selecting the boards I want, I stuff these 10 foot long pieces of lumber into my truck and haul them down to my basement once I arrive at home. I’d like to remind you that My basement wood shop, which I affectionately refer to as Lava Lands Wood Shop(because there are small basalt columns in my shop which are remnants of an ancient volcanic eruption) is not a show room and it is not especially pretty but is is efficient and I do a lot of real blue collar work there. I bet the guys on “This old House” don’t have a lava flow in their shop! Perhaps the only thing pretty about my shop is my new Cabinet grade Table saw(Thanks to the folks at Grizzly who made it). 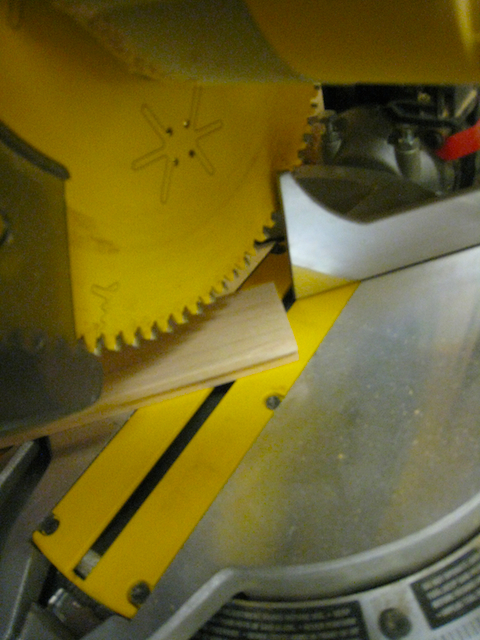 I love my table saw! I is burly(526 lbs) and will cut through anything. Yes, Mom, I know it will cut through my arm too. 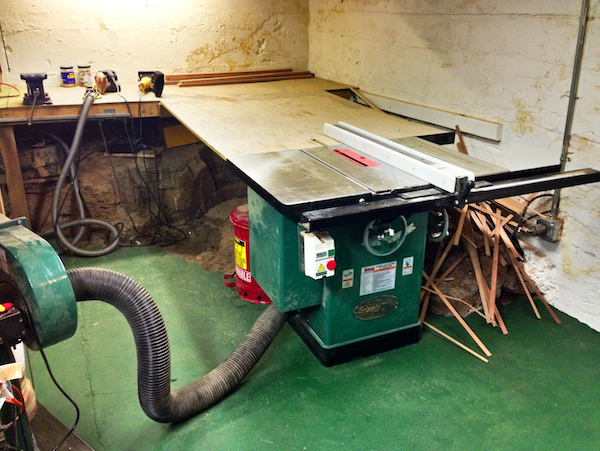 Below is a dusty shot of my workhorse grizzly table saw. Back to the frames. I decide how many frames I want to make and of what size and then determine which individual board will work the best for my purposes. 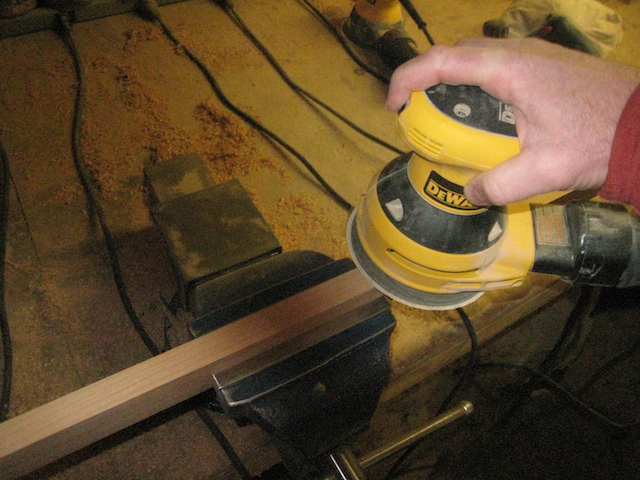 I then chop the boards to approximate length with my Dewalt miter saw. 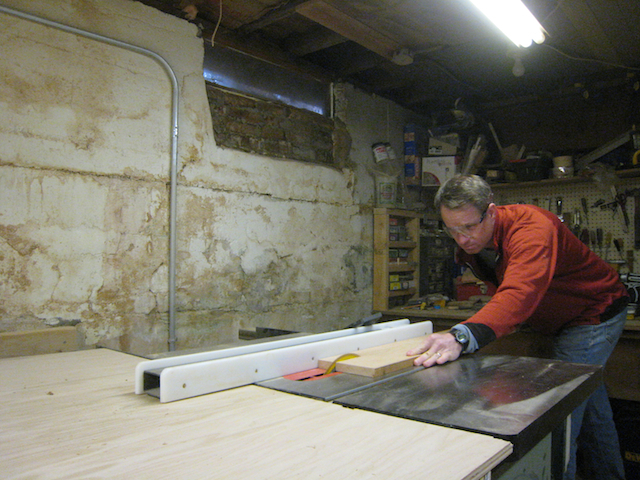 Next I rip the wood to the appropriate width with my beautiful Grizzly Table Saw. Ripping wood to width on my table saw. 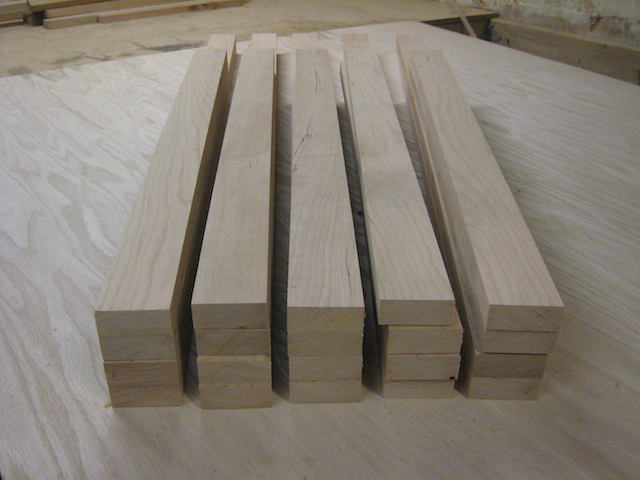 I usually rip the wood for several frames at a time until I have stacks of wood of the appropriate dimensions as seen below. Unstained cherry wood cut to dimensions for picture frames. 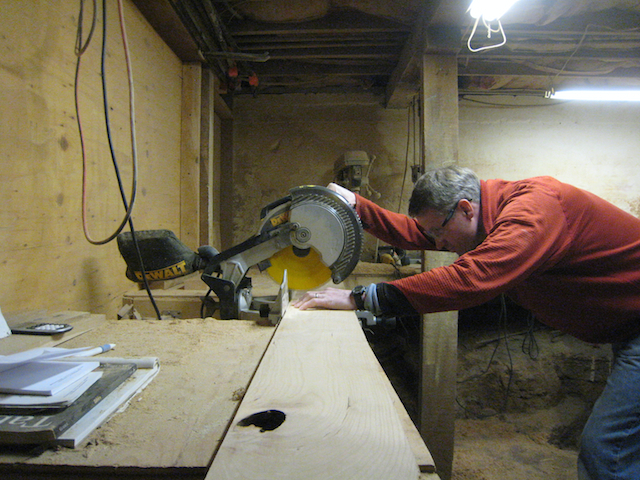 Next I examine each piece of wood and determine which of its two wide faces are best for the front of a picture frames. I don’t like sap wood(white wood) to show on the face of my frames and I don’t want any cracks or worm holes to be present either. After the inspection, I cut a “Rabbit” out of one corner of the bottom face of the wood so that I have a notch to fit the print, backing,glass,matting, etc. into. Below is a picture of m cutting a rabbit out of a piece of framing wood. Next I step over to my vice and do some more fine tuned work. First I plane out the saw blade marks from the ends of each piece of wood. Next step is the first of many steps involving sanding. Sanding is dusty,tiring, monotonous, it makes my hands achy the next morning, and I do a great deal of it on every frame I make. Despite being a grueling part of making frames, the results are wonderful. To feel a buttery smooth face on a piece of hard wood is always rewarding. First I sand each exposed side of a given piece of wood with 100 grit sand paper, then I sand it with 220 grit sand paper. Sanding the edge of a piece of hard wood. Sanding is a very time consuming step in my frame making process. After it is thankfully over, I miter the corners of each piece of wood as seen below. 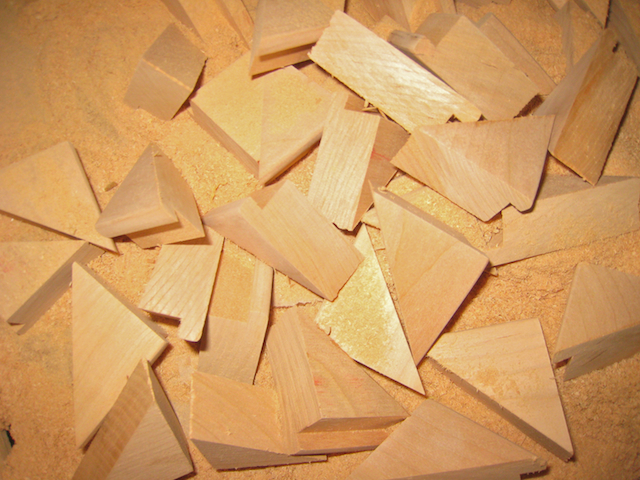 Then I’m left with lots of little triangular pieces of wood. I typically throw these pieces away but I suspect they would make great kindling for a fire place, so if any of you readers happen to live in Bend, Oregon and need some great kindling for your wood burning fire place, you are more than welcome to come pick it up at my house. Waste wood/kindling for anyone who wants it! After Mitering, I pair and mark and number the corners so that I can accurately join the corners when glueing and clamping them. I match up adjoining pieces and mark a joining point that serves as a marker for cutting a biscuit slot. 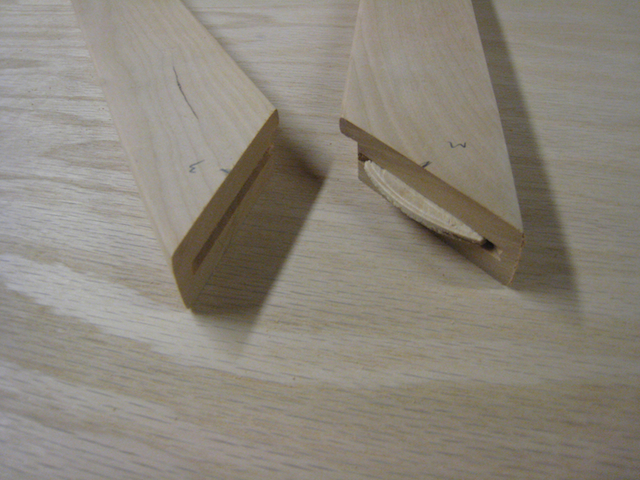 Below is an images of two mitered ends. One with a biscuit slotted into the joint face. 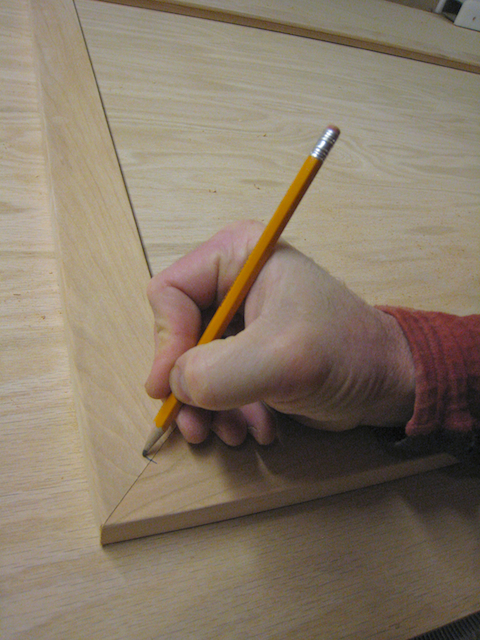 Two mitered ends with a biscuit slotted into one end of one of the framing pieces. The idea of adding a biscuit joint to picture frames or any piece of furniture is that having a biscuit slotted gives more surface area for glue to adhere to, therefore making for a much stronger joint. This might be a little over-kill for picture frames but I like the idea that my picture frames are very durable and under normal conditions should last a lifetime. You can see glue dripping off of the corners of the frame in the image above. After 24 hours of hardening, I begin another long session of sanding to even out and round off the corners and to remove any glue that has been smeared on the frames face during the glueing and clamping process. I start this session with 100 grit sandpaper and follow that up with 220 grit sandpaper. Once everything is smooth, I burnish the entire surface of the frame with 0000 steel wool. Burnishing serves to further smooth the frames surface and slightly darken it as well. With vigorous rubbing, the surface of the frame actually heats and finishes with a wonderfully smooth finish which helps to highlight the beautiful grain of the cherry wood that I use to make the frames. Burnishing gives me a brisk upper body work-out and gives my frames an excellent quality finish. After burnishing, I apply natural oils to the frame which slightly darken the wood’s surface. 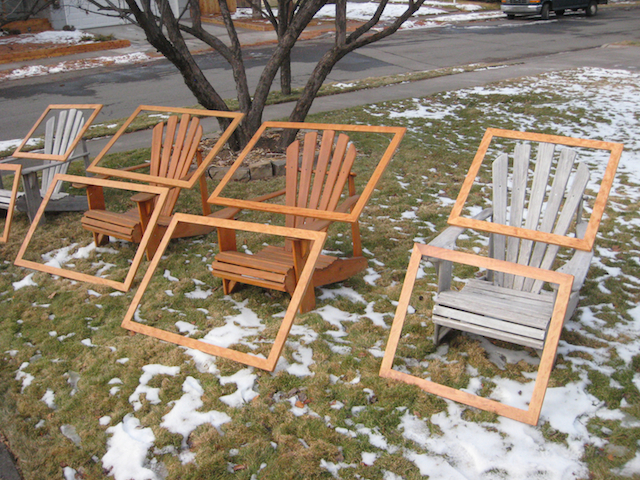 Frames are often lighter in color than I want them to be after I finish oiling them so I set them outside in direct sunlight to help darken the frames a little bit. Suntanning my frames can be a little frustrating during winter storm cycles that offer little direct sunlight and frequent snow falls. If I have a delay in framing, it is usually because of this set in my framing process. For those of you not familiar with cherry wood, cherry naturally darkens with age and exposure to ambient light. Each piece of wood has a limit beyond which it won’t darken anymore, but some pieces can get quite dark. I try to reinforce this fact to collectors who select my framing rather than opting for their own custom framing. I am quite proud of how my frames look and how they make my landscape photographs look but it is important to note that I am never offended if someone wants to have one of my prints custom framed. I do the framing at cost so I receive no monetary benefit from someone selecting my frames. They are also very labor intensive( hours of work goes into each frame) but because I enjoy the process and because I like how they make my prints look, I continue to offer these hand made frames at a very reasonable price. 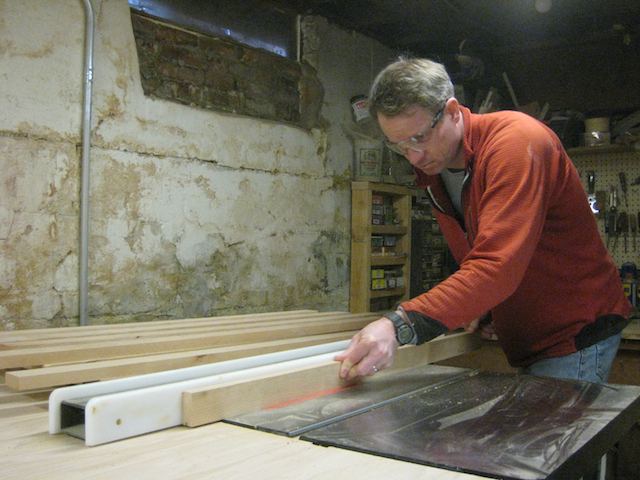 I should also note that while I do make all of my own picture frames, I do not cut my own mattes or glass. I leave that up to the guys at Art On The Go (David, Brian, and Matt) who do a great job at a fair price. I don’t have the space for matting equipment in my home and I honestly don’t think I could do as good of a job as they do anyway. While making frames is far from blissful, I do enjoy the results and the opportunity to make something beautiful with my hands. 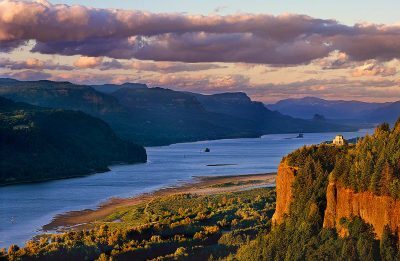 It is a very blue collar activity but one that gives a little balance to my life as an Oregon landscape photographer.